Do Bunions Always Require Surgery Treatment? A bunion is a bony deformity of the joint at the base of the big toe. The medical name is hallux valgus. The main sign of a bunion is the big toe pointing towards the other toes on the same foot, which may force the foot bone attached to it (the first metatarsal) to stick outwards. Other symptoms may include a swollen, bony bump on the outside edge of your foot, pain and swelling over your big toe joint that's made worse by pressure from wearing shoes hard, callused and red skin caused by your big toe and second toe overlapping, sore skin over the top of the bunion, changes to the shape of your foot, making it difficult to find shoes that fit. These symptoms can sometimes get worse if the bunion is left untreated, so it's best to see a GP. They'll ask you about your symptoms and examine your foot. In some cases, an X-ray may be recommended to assess the severity of your bunion. Anyone can develop a bunion, but they're more common in women than men. This may be because of the style of footwear that women wear. 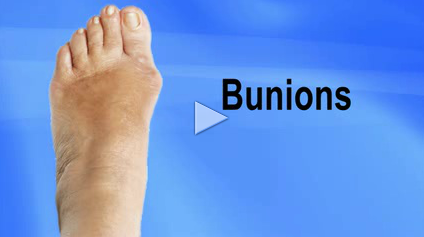 Causes of bunions are foot injuries, neuromuscular disorders, or congenital deformities. People who suffer from flat feet or low arches are also prone to developing these problems, as are arthritic patients and those with inflammatory joint disease. Occupations that place undue stress on the feet are also a factor; ballet dancers, for instance, often develop the condition. Wearing shoes that are too tight or cause the toes to be squeezed together is also a common factor, one that explains the high prevalence of the disorder among women. SymptomsWith the positional change of the hallux, pain is a common occurrence. As the foot goes through the gait cycle the hallux plays an integral role as the body's weight transmits through during propulsion. With this in mind, it easy to see how the change in the hallux joints (metatarsal phalangeal joint and the proximal interphalangeal) would cause joint narrowing and early degeneration of the articular cartilage. In addition, two small bones (ossicles) found underneath just behind the joint will start placing extra pressure on the metatarsal. Along with bony changes, there are many soft tissue changes as the hallux and metatarsal reposition, which causes added strain to other bony structures and can accelerate the problem.